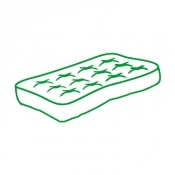 Health care facilities use an enormous number of mattresses. When there are no longer fit for patient use, they are often sent to landfill, where they can take over 100 years to decompose. In 2011, Vancouver banned mattresses and boxsprings from landfills. The result was over 50,000 mattresses and boxsprings being brought to recycling centres, more than 1 million cubic feet in landfill savings, and the creation of 45 new jobs for residents of British Columbia. Mattresses and box springs are created from a number of materials, including wood, metal, fabric and plastic, which can all be recycled once they are separated. The Balance. Mattress Recycling Business Opportunities.